I’m still reading, but haven’t been active in the blog world for about five months. It’s freeing, in a way. I can read a book and start another immediately, enjoy something without having to analyze why. I’m realizing more and more that it’s less stressful for me not to worry about maintaining this blog. And yet, part of me it still reluctant to let it go. I’m going to take a step down and go back to recording the books I read in a handwritten journal. I honestly do enjoy revisiting my thoughts from time to time, like a mini reread. I may type some of them up here or I my not; we’ll see how it goes. I’m getting into the busiest part of the school year for me and taking a grad class as well, so I may not even have all that much time for reading. I wanted to do mini posts on the stack of read books next to my shelves, in order to do an accurate year-by-the numbers, but they keep trying to turn into proper reviews. This may be harder to get closure on than I thought. The most difficult part for me is always writing the summary, especially the longer its been since I read the book, so I may set a one-paragraph limit on the rest just to get through them. I’m hoping that a switch to a more succinct format will cut out what seems to be a stumbling block for my OCD tendencies. I have drafts from three years ago that I still feel guilty about never finishing. It’s time for me to move on. 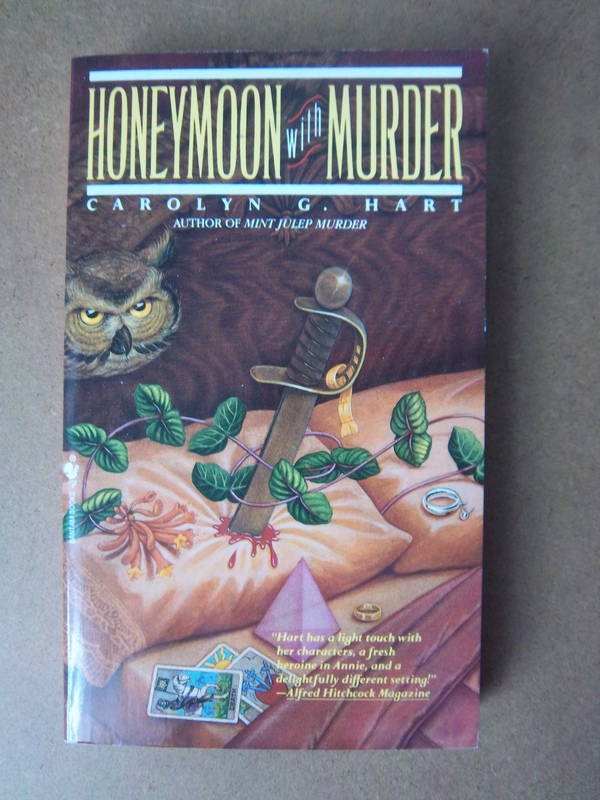 It felt fitting to end the year on a cozy mystery, so I went back to Carolyn G. Hart’s Death on Demand series. It’s another one where I am waaay behind; this is number four out of twenty-two and counting. In Honeymoon with Murder, Annie has just tied the knot with Max when she gets a frantic midnight call from her employee and matron of honor, Ingrid. The couple arrive at her house to find the warm corpse of Jesse Penrick; Ingrid is nowhere to be seen. Jesse loved to spy on his neighbors and make their lives miserable, so no one is sad to see him dead; unfortunately for the missing Ingrid, however, he had picked fight with her just that morning. This makes her look like a pretty good suspect to conceited mainland circuit solicitor Posey, filling in while the local chief is on vacation. It’s up to Ingrid’s friends, led by Annie, Max, and the indefatigable Hetty, to prove her innocence and find both her and the real killer. We get a body early on here, much better than in the last one, but there are still plenty of suspects and plenty of clues. Even those who are not murderers have things to hide, which is where Max and Hetty’s information-gathering skills come in handy. All of the bluff, bluster, and breaking-and-entering, though, fall to Annie. Carolyn Hart plays fair, so that the mystery-solving experience is challenging and rewarding. I never feel like she is pulling the rug out from under the readers. Hetty started out in the first two books as annoying, before she proved her sleuthing skills to Annie and Max. Max’s mother Laurel picked up the banner in the last book and still comes across as annoying rather than humorous; I think Carolyn Hart was going for a blend but I can’t quite be sure. I have a feeling she will continue to pop up in the series. The constant name-dropping of detectives, titles, and authors still hasn’t gotten old yet, though Hetty and Annie must have cart catalogs for brains. In fact, I found myself writing down a few interesting-sounding references to look up for later on, like Anne Morice. I believe my favorite was when Annie posed as a reporter and chose the pseudonym Beverly Gray. Sometimes I forget how old these books are, though the lack of Internet-based research should be a giveaway. I didn’t even look at the date (1988) until it was mentioned that two of the older characters served in WWII. The series seems to have aged very well so far. I’m curious how much Max and Annie actually age over the course of it. 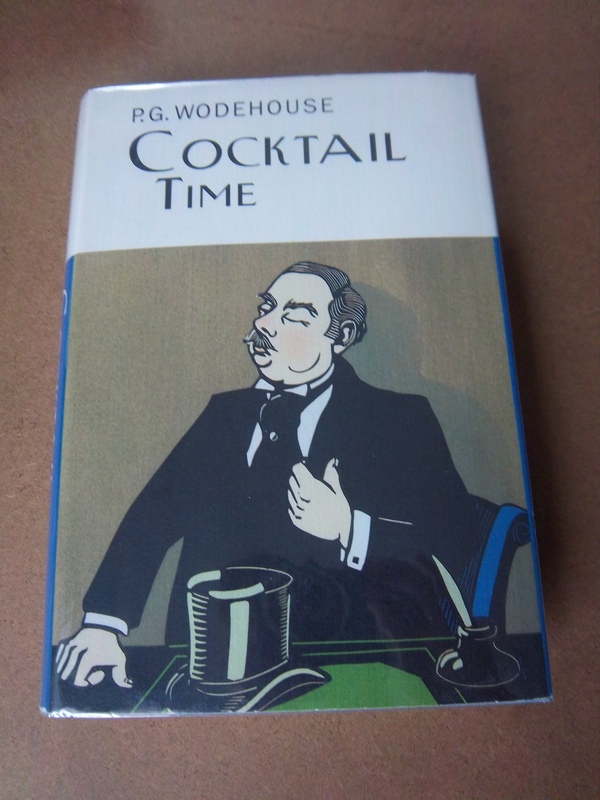 It’s probably just a coincidence that both PG Wodehouse books I read, I read when I was sick in bed, but perhaps it is true that laughter is the best medicine. Cocktail Time was exactly what I needed after spending Christmas Eve and Day with a fever and cough. The Earl of Ickenham is on vacation from his wife (or perhaps the other way around), and in his benevolent way feels it his responsibility to clear up the problems of others. Everyone else is not quite sure if “clear” is the right word; “meddle” or “muddle” might be more accurate. There’s his nephew Johnny, desperate to shake his nanny before proposing, his good friend Sir Raymond, trying to hide the fact that he anonymously published a scandalous novel, his war buddy Peasemarch, butler to Sir Raymond and in love with his sister, and several others trying to get rid of or obtain someone or something. For Ickenham this is a jolly exercise, and it does turn out all right in the end, even if there’s a bit too much excitement. P.G. Wodehouse’s books have a certain timelessness to them; I was shocked when he referred to a TV in a pub, and flipped to the front to see that this was published in 1958. The insular nature of the country house setting seems to have stayed the same across the decades. I liked Picadilly Jim, but I loved Cocktail Time, and gave it to my mom to read as soon as I finished. It hit all the right notes, whereas the former tried a little too hard to be a romance. The multiple love stories succeed here because they are treated very matter-of-factly, with comic effect. The Ickenham system prescribes that you “stride up to the subject, grab her by the wrist, clasp her to your bosom and shower burning kisses on her upturned face. You don’t have to say much, just “My mate!” or something of the sort, and of course, in grabbing by the wrist, don’t behave as if you were handling a delicate piece of china. Grab firmly and waggle her about a bit.” You can imagine that this is not always met with success. I have a few more of these lovely Overbrook editions, including a Jeeves and Wooster. I’m always on the lookout for more to add to my collection, but they are expensive to buy new. 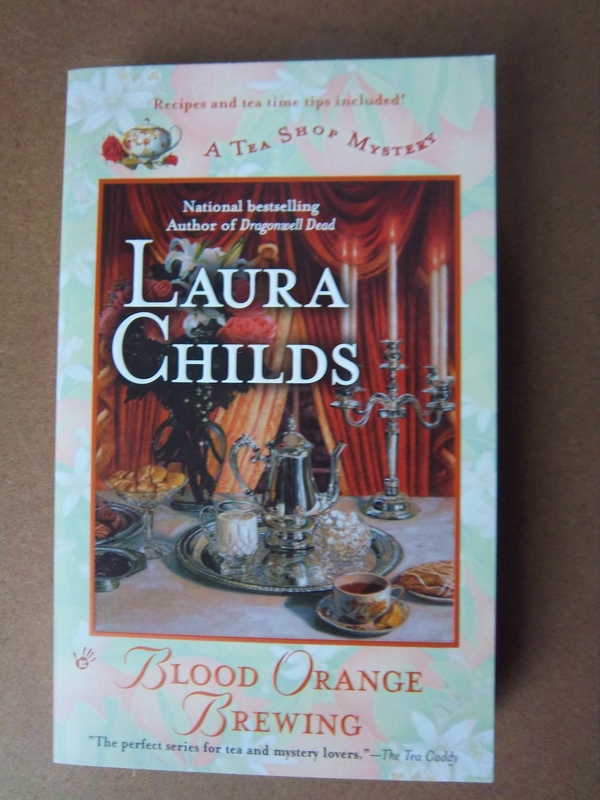 I’m back once again to Laura Childs’ Tea Shop Mysteries. In this seventh installment, Blood Orange Brewing, a local figure meets a gruesome end at an event Theodosia Browning’s tea shop is catering. [Seriously, every book starts this way. Either nobody in Charleston gets murdered in private, or criminals are dumb enough to wait until they know a woman with investigative instincts and lots of connections is present. The set-up is getting a little old.] In this case the event is a fundraiser to restore a Civil War-era house recently donated to the Historical Society, and the victim is a well-loved politician still involved in many local matters. There are plenty of connections between Duke Wilkes and the throngs of people at the house when he died, but no real leads. When the widow asks Theodosia to investigate she cautiously agrees, despite her other obligations like hosting a wives tea for the backers of a smarmy Congressman. Bad things first: the first chapter was horribly written. I saw at least four fragments masquerading as sentences. Within the span of a few pages Childs described “heroically tall bouquets” and a character’s “heroic teeth;” I’m not sure how the word applies in either case. It also mentioned that Theodosia looked up at the dying man, as if the murder were copy/pasted from the balcony death in the previous book. Luckily either the writing improved, or my brain switched over fully from editor-reading to content-reading. The only other thing that made me wince was mention of a recent newspaper article credited to staff writer C.S. Lewis. That can’t have been an intentional reference, yet no proofreader picked up on it? The plot was also a little on the weaker side. Though I don’t expect or want Agatha Christie from this series, it felt like there were too many red herrings or loose ends, I’m not sure which. Haley’s contract for a cookbook is in the works and then never mentioned again, though the thread will likely be picked up in the next book. Two unlikeable characters are left as just that, while a built-up character is killed off later. It’s never quite revealed how both victims learned the information that led to their deaths, or how the killer knew that they knew. On the plus side, Childs was able to work in as usual an unconventional motive that comes out of nowhere. She also finally broke the pattern about who she chooses as the culprit, though I was still able to figure it out through process of elimination. There are plenty of good things about the series that keep me reading, like the charm of the tea shop and the everlasting ode to historic Charleston. Theodosia really does have a believable working relationship with Inspector Tidwell: several steps behind on some aspects of the case but able to provide important information because of her ear for local gossip and snooping skills. She was suitably timid at first, giving the close call her last investigation ended in. There is also a fantastic part where she and Delaine explore a secret passage in the creepy old house, which felt like something right out of a Nancy Drew book. I’ll probably take a break from the series before picking up with them again in the new year. There are still six more I haven’t read, and I also want to start over again with her scrapbooking mysteries. At least i can chalk this up as a success for the year of the reread. Several years ago, my mom went on an Elizabeth Cadell binge. She read all the ones she could find in the library system, and enjoyed them so much that she enlisted me to track them down online. I managed to find about thirty of them for her, mostly in hardcover, but I actually never read one myself until now. The Past Tense of Love grabbed my attention out of all of them because it was a paperback (and therefore in the front row), a blue book amid white spines, and a duplicate being pulled for the sale pile anyway. My mom said it wasn’t one she particularly loved, but I’m okay with that; I’d rather not start with an author’s best lest nothing else quite measure up. Kerry Cromer is little like her staid aunts and sister; she thrives in her London flat and demanding job as secretary to a grumpy businessman. Perhaps she has some of the wanderlust that caused her own mother to leave without a trace years ago. Kerry is all set to take a vacation with a man she is trying to decide if she loves when her boss sends her on a secretive but important errand to a remote village in France. There, a conceited artist, a beautiful woman, and an American family on a yacht may hold the keys to Kerry’s past and future. The Past Tense of Love was a perfectly fine book. I wasn’t quite in love with either Kerry or Pierre, though their romance was fine enough. I also, like Kerry, wasn’t actually interested in knowing who her father was. The plot summary makes the book sound more suspenseful than it really is. There are humorous elements, and a wistful bit about a lovesick but forgetful old professor that I believe is mainly meant to show us Kerry’s compassionate side. It was definitely not a bad book, just not quite memorable either. 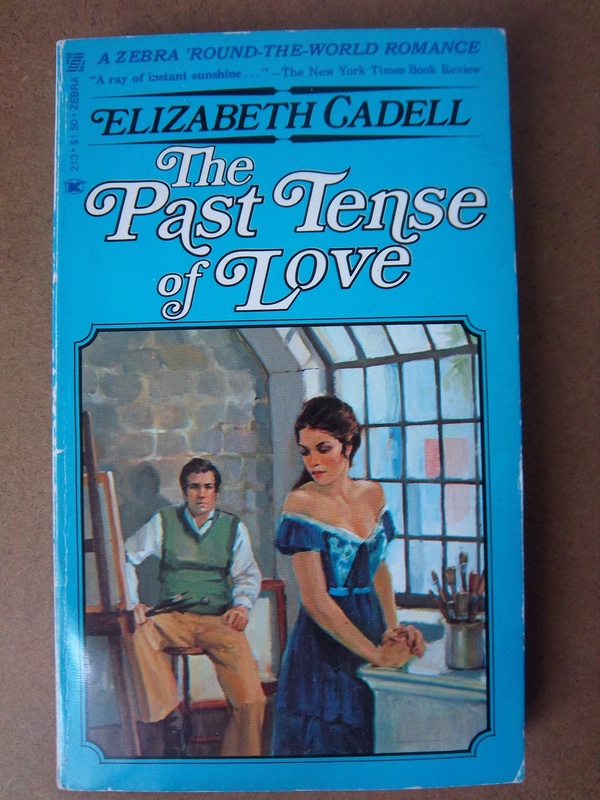 Elizabeth Cadell wrote almost sixty books in forty years; this is from about the middle of her career, but a time when she was cranking out two books a year. It makes sense, therefore, that it might not be one of her strongest entries. Now that I know what her books are generally like I can choose a more popular one for the next go-round. I have so many things to tell you that I scarcely know where to begin. First let me announce that I am in for an adventure–a real flesh and blood adventure into which I plump without premeditation, but an adventure of so delightful a kind that I hope it may continue for many a day. I know you’ll say at once, “That means Woman”; and you’re right. I definitely have Melody to thank for introducing me to A.M. and C.N. Williamson. I picked up a few on Bookmooch a while ago, and a sick day seemed the perfect excuse for a musty old book, though I had to look up online which one came first. 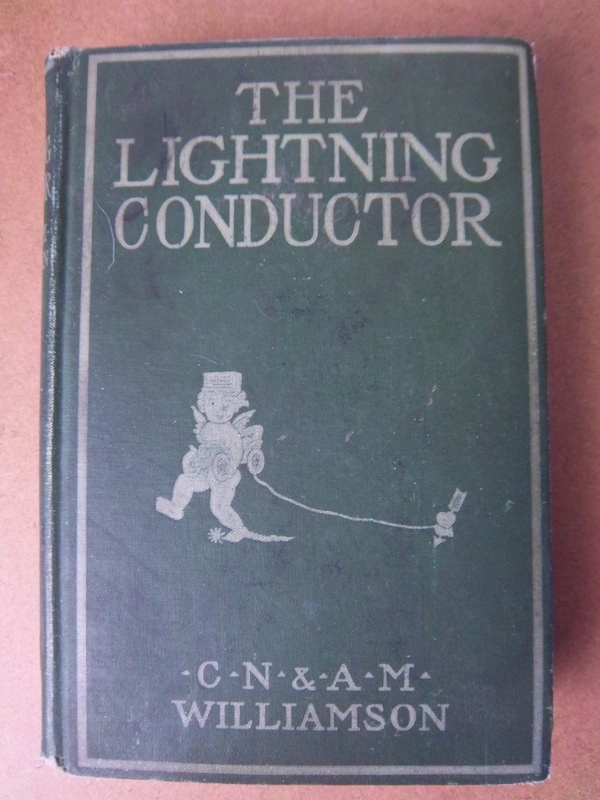 The Lightning Conductor it was. I’m not going to summarize too much because it’s not necessarily a book where things happen (plus, you can read that here). Suffice it to say that young American heiress Molly Randolph, while embarking on a European tour with her Aunt Mary, is smitten with an automobile she sees, and happily agrees when the owner offers to sell her both the car and the chauffeur. The car turns out to be a clunker, and the chauffeur absconds with the money when she sends him to the next town over for new parts. Luckily, she is met on the road by the Honorable John Winston, out for a ride in his own snazzy Napier. He is as smitten with Molly as she was with the car. On the spur of the moment he decides to pass himself off as his own chauffeur, Brown, and offers up his services to the Randolphs. Molly gratefully agrees. She engages him for her entire trip through France and Italy, and finds him pretty much indespensible. It’s hard not to like a novel with Molly as a main character, or to see why Jack is in love with her. she begins a letter to her father “Dear Universal Provider of Love and Cheques,” and ends another “Your sinner, Molly.” She is irrepressible in her enthusiasm, while at the same time appreciating the beauty and history of the sights they take in. Jack, meanwhile, is having a rougher time “slumming it,” and spends half his nights reading up on the next day’s tourist sights to continue enthralling Molly with his knowledge. Eventually his double life catches up with him in a funny case of mistaken identities, but all ends well in the end and he and Molly can finally admit they’re in love. It wasn’t until the last third of the book, when they reached Italy, that I started to get tired of the travel descriptions and began skimming for the next plot development, but that may also be because I read most of the book in one day. After a while, reading letters about charming villages and historic chateaus and beautiful views is like looking at one too many of someone else’s vacation photos. (It did remind me of this recent news tidbit.) Overall, though, it was an entertaining read with likeable characters. It was a fascinating look at early cars, with interesting bits about social class distinctions as well. Plus, I always enjoy a good epistolary novel. I believe the other Williamsons’ book I have, The Princess Passes, also includes Molly and Jack as secondary characters, though I don’t know if I can handle another car trip just yet. 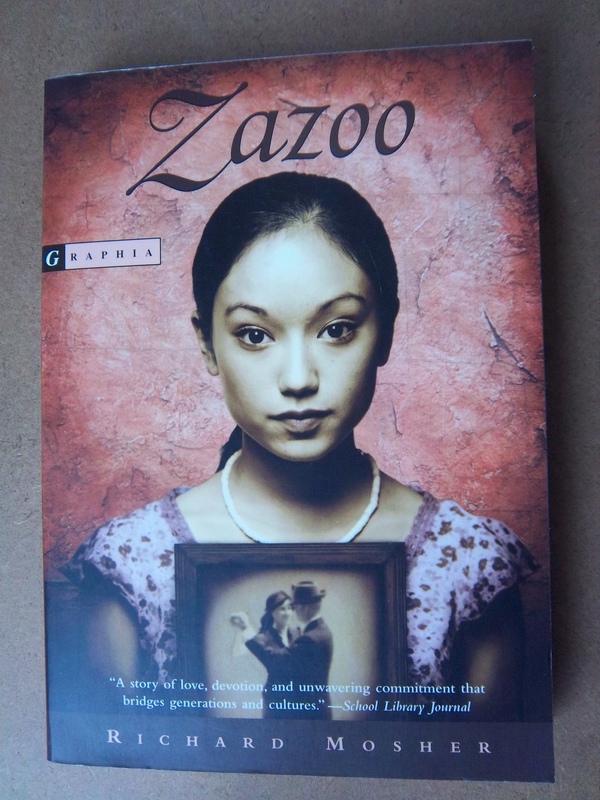 In my ongoing quest to read forgotten books from my shelves, I turned to Zazoo , by Richard Mosher. It was published in 2001, so I must have gotten it not too long after. I know my mother gave it to me for Christmas. Though she has excellent taste, I delayed cracking open the beautiful little book. I think at that point in my reading habits I was reading multiple books by an author all at once, and this didn’t quite fit the pattern. The story takes place in France and is narrated by a 13-year-old girl who was brought from Vietnam as a toddler by her adoptive French grandfather (making this set in the early 1980’s, I believe). They live together in a small village, and operate the locks on the canal. Zazoo dotes on Grand-Pierre, and the little life they have built together, especially the love of poetry that they share. She also feels right at home on the river, always swimming or sailing or skating. Slowly, however, things begin to change for Zazoo. A smiling boy comes to town, asks about the pharmacist, and leaves again, promising to send a postcard. Grand-Pierre is slowly developing Alzheimer’s, and Zazoo feels he is slipping away from her. She also starts to notice that he never goes into the village or interacts with anyone in it, even sending her to pick up his medicine from the pharmacist.When she presses him for information, however, she realizes she is not sure she wants to know the truth, dating back to when he was a young man and the village was occupied by Nazi’s. Even at first glance, the book hits all the right notes for me: France, WWII, love stories, and secrets from the past. It is more than that, however. The writing is slow and sweet and beautiful, like the poetry that Zazoo writes. I fell in love with the characters, perhaps Felix most of all, and could clearly picture everything through the lovely imagery. It is a story of healing, and of relationships that can overcome the circumstances. If you can find a copy, please read it. It does not feel at all like a “typical” young adult book, and Zazoo is old beyond her years. This is definitely one of my favorite books for 2012. 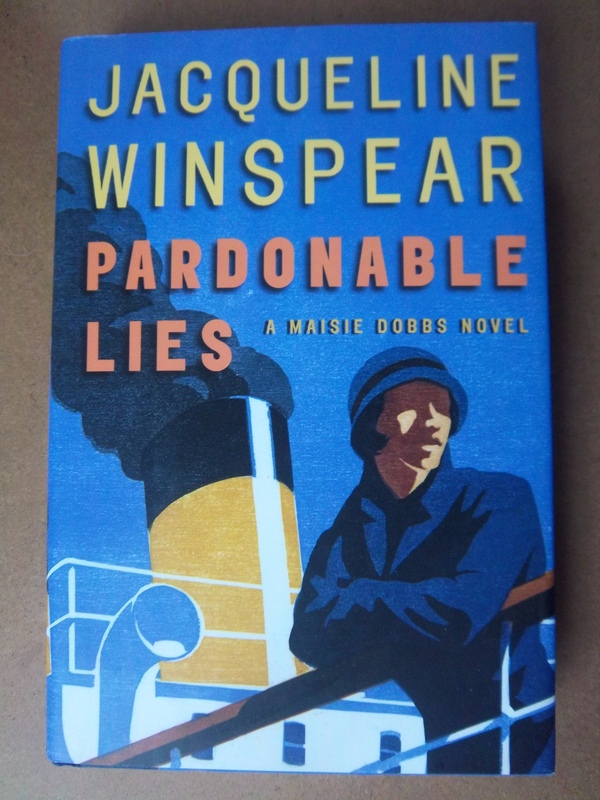 I read the first two books in Jacqueline Winspear’s Maisie Dobbs series about two years ago, and it was high time I returned to England between the wars. In Pardonable Lies, Maisie is asked by Sir Cecil Lawton to fulfill his wife’s dying wish and investigate the death of their son in France during the war. She always believed that Ralph was alive, though in some ways he was dead to Sir Cecil even before becoming a pilot. When Maisie connects with her old school friend Priscilla she is surprised to receive a similar request. Peter is the only one of her brother’s whose grave she has not visited, because her mother threw away the telegram describing his death and burial. What seem like routine investigations hold unseen challenges. Records are missing or inaccessible for both soldiers, and reading the papers the dead men left behind reveal that there may have been a link between the two. Unfortunately, that would mean a return to France for Maisie, who has not been since her dismal nursing days and injuries during the war over a decade prior. Her duties to her client and friend win out, and she embarks on a journey to confront the secrets and demons of the past. Pardonable Lies turned out to be my favorite entry in the series so far. Maisie comes across as much more human and vulnerable. The plot was also…I don’t want to use the term romantic, but it’s the closest I can think of. We have undercover missions and secret liasons, and a French village that recalled Assignment in Brittany. The horror and tragedy of the war are still present, but I guess the figures involved just seemed more heroic somehow. I wanted to finish this review first, but I hope there is not as long of a gap until I read the next Maisie Dobbs. I’ve heard that the series improves as it continues. I’m still trying to pick out and read the books I’m not sure I want to keep–ones that got a lot of buzz but may or may not actually live up to them. 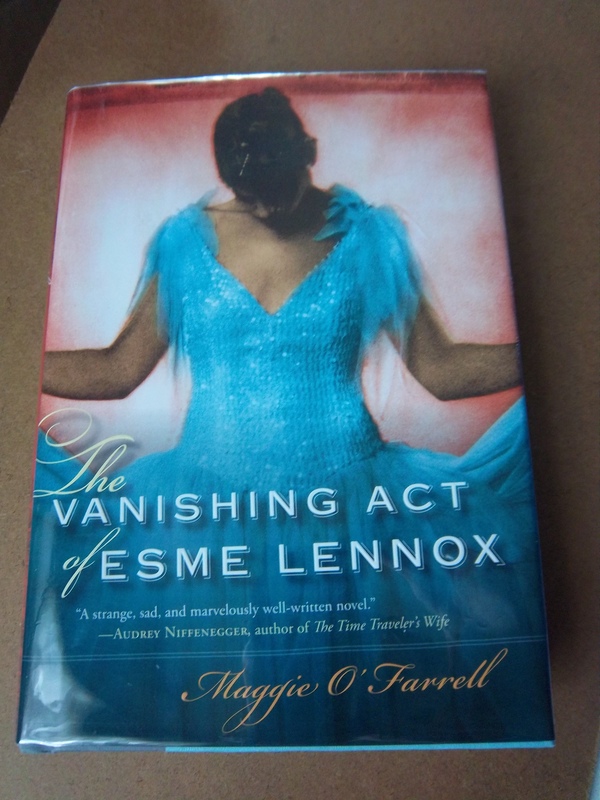 The Vanishing Act of Esme Lennox, by Maggie O’Farrell, is one such book. The premise is that one day, Iris Lockheart gets a call from Cauldstone Hospital asking for her decision about her great-aunt Esme Lennox. The mental hospital for women is closing, and after sixty years of staying there Esme is deemed harmless enough to transition back into the real world. The trouble is, Iris never knew Esme existed. Her own parents are dead, and her grandmother Kitty, who always claimed to be an only child, is in a nursing home herself with Alzheimer’s. Iris also has her own troubles to deal with–her relationship with her step-brother Alex and her affair with a married man–but somehow she finds herself drawn to her new-found relative. O’Farrell writes the story from both Iris and Esme’s perspective. Esme isn’t necessarily an unreliable narrator, but her viewpoint is wandering and sometimes fragmented. She recalls things incompletely and revisits them later, especially concerning her early life, which makes the book more suspenseful. Even with Iris’s own story, O’Farrell carefully chooses what to reveal and when. We learn a lot about Esme and Kitty’s childhood in India and eventually Scotland. Esme is a dreamy child who rebels against conventions. She has always been thought of as just a little strange, which a traumatic experience does nothing to help, but she is intelligent and could have gone to college if she were allowed. Instead she is stifled by what is expected of an Edwardian young woman, until a final desperate act causes her family to lock her away. The bulk of the book is so sad–Esme’s experiences growing up, her empty life at the hospital, and what Iris learns about how all-too-common this plight was. I almost don’t want to think about the fact that things like this probably really happened to flighty daughters or mothers with PPD. As much as I like historical fiction, there are many advantages to our modern world. On the other hand, Iris’ part of the story feels unnecessary at times, an extra drama that detracts from the mood of the main threads. I also dislike when books have ambiguous or unresolved endings. Overall, The Vanishing Act of Esme Lennox is well-written, but incredibly haunting rather than enjoyable. It’s one I see myself remembering instead of rereading. Even if this book goes to the sale pile, which it still might, I highly recommend it. 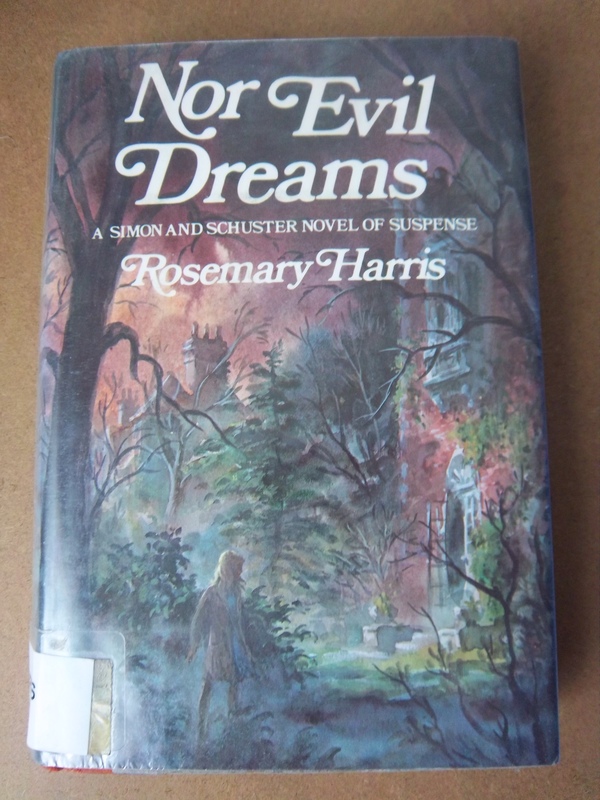 I really wanted to like Nor Evil Dreams, by Rosemary Harris (this one, not the actress or current mystery author). I got it for a quarter several years ago at the Brookline Library sale shelves because it was advertised as “A Simon and Schuster Novel of Suspense” and I’ve always seen myself as a repository for old gothic and suspense books. In this case “old” means 1968 rather than historical. Prudence Brenning and her housemate Victoria are teachers at a private school in London. Though Prue is a new hire, she has heard about the anti-Semitism that happened a year or two before. Now, however, it seems to be flaring up again. Then the local temple burns down, killing the rabbi’s son. To make matters worse, Prue accidentally left her recorder for recitations on in the library common room and taped a conversation implying that the fire was intentional. Unsure of what to do, she takes the tape to history teacher and Holocaust survivor Mark Bronov. Prue is already half in love with Mark, despite the age difference and his reclusive nature. At her urging, he tells her about his experiences in the concentration camp and his power struggle with a sadistic German officer, who escaped when the Allied forces arrived. It is this officer, Max, who may be the man mentioned in the tape, come back to hunt him down. Mark insists on a lot of secrecy, but someone still seems to be after Prue; one day, when home sick from school and sleeping, she is almost strangled. Eventually she and Mark are quietly married and she moves in with him, which brings its own set of problems. The suddenness of the affair drives a wedge between Prue and Victoria. Mark has recently brought his orphaned nephew Janni back from abroad, a surly teenager whom Prue believes hangs out with an anti-Semitic crowd. A strange old man is hanging out around the house. Something is wrong that Prue can’t quite put her finger on. So. Turns out that Mark is actually Max, the Nazi officer who took the identity of one of the prisoners in order to escape without punishment. He and his friends were responsible for the temple fire. He killed the old man, the real Bronov, for fear he would be revealed. But he loves Prue and is changing his ways, really. And Prue, still loving him despite her horror at his murdering ways, is thisclose to running off with him to South America like he asks, so she shoots and kills him. And serves a short prison sentence because she believes herself guilty. And plans to bring up the child she carries alone to try to make amends for both herself and Mark/Max. It’s probably very telling that I had to start another book very soon after finishing this one, that it showed up briefly in my dreams that night, and that I’m shuddering now even writing about it. I’m not sure why it affected me so strongly. I was trying to tell my mom about it, and she said it sounded like it was very well-plotted. It is! It’s just rubbing me the wrong way. The stubborn part of me is still having trouble putting the book in the sale pile, especially since I still have one other by her (The Double Snare). And I guess I’ll read it at some point. But it concerns amnesia and maybe a slight political subplot, and I think there are lots of other books that I would like to read first. Has a book ever affected you in a negative way. more than just dislike?